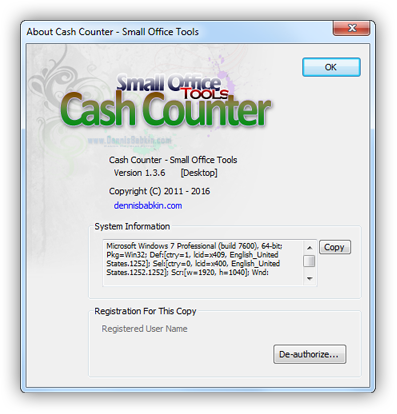 The Cash Counter app is a part of the Small Office Tools suite that was designed to provide specialized, easy-to-use software for a small business office. The Cash Counter specializes in keeping the cash till of a small business in check. The Cash Counter program is both very small in size and quite versatile in its application. Read on for details on how to use it. Desktop version: Before you can take advantage of the Cash Counter program, you need to download its installer. It comes packaged in a ZIP archive. After you've downloaded and opened it (and passed all of the "mandatory" Windows warnings), you will need to run the installer file. Then follow on-screen instructions to install the Cash Counter app. After that you're done, and can now delete the installer package that you downloaded earlier. Windows Store version: Can be installed directly from the Windows 10 Store. Desktop version: Before uninstalling the Cash Counter app, make sure to close it first. Windows 10: Go to Start -> Settings -> System -> Apps & Features and locate "Cash Counter - Small Office Tools" in the list. Then click it and select Uninstall. Follow on screen instructions to finish uninstallation. Windows 7 & earlier: Go to Start -> Control Panel -> Programs and Features and locate "Cash Counter - Small Office Tools" in the list. Click it and select Uninstall button above. Follow on screen instructions to finish uninstallation. Windows Store version: Go to Start -> Settings -> System -> Apps & Features and locate "Cash Counter - Small Office Tools" in the list. Then click it and select Uninstall. Follow on screen instructions to finish uninstallation. WARNING: Uninstalling Cash Counter app will permanently remove all of its collected data! In case you want to read additional details about uninstallation of previous versions of the Cash Counter app, please refer to this FAQ. Note that the Cash Counter memorizes previous states of its controls so some fields may be filled out differently in your case. 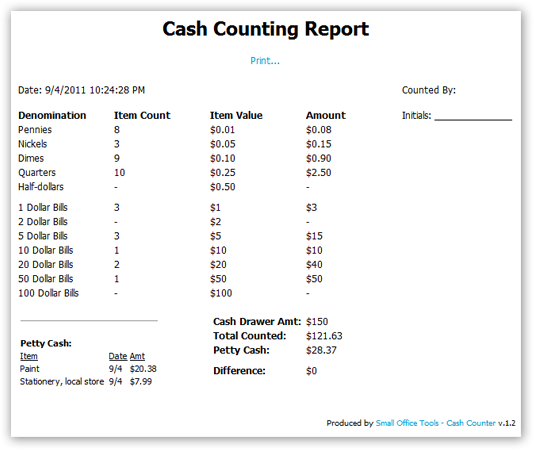 Cash Count Fields are located in the main area of the Cash Counter window. Their layout is dependent on the selected country and the currency format for that country. They are broken down into currency denominations specific for the selected country and are grouped into two columns. Denominations in the left column are intended to represent coins, and denominations in the right column - bank notes, although this classification is not rigid and could be changed in the Preferences. Denomination Name on the left. It can be grayed out in case of a rare denomination. This name can be also adjusted in the Preferences. Denomination Value expressed in the amount of a single unit of currency for the selected country. Text box field for the number of units of this denomination. It allows you to enter a positive number to represent the count for that particular denomination value. You can also leave this field blank to represent zero. To enter a count value into this text box you can left-click it with a mouse and type in the number on the keyboard. After that you can switch to the next count field by pressing the Tab key on the keyboard (or the Enter key, if configured in the Preferences). You can also use the Up and Down Arrows on the keyboard to navigate through the cash count fields. While navigating through the cash count fields using the keyboard the Cash Counter will skip any unfilled rare denominations. This can be adjusted in the Preferences. Total amount for this denomination, presented after the equation sign. It indicates the monetary amount for this particular denomination value, times the number of units. Cash Drawer Amt field allows you to enter the amount that is supposed to remain in your cash drawer when it's balanced. The calculation of the Difference and whether the cash till is balanced or not will be done against this amount. The Cash Counter memorizes the Cash Drawer Amount so that you don't have to enter it every time. Total Counted control contains the total value of currency counted in the cash count fields. This amount will change automatically as you enter new, or edit existing cash count fields. Petty Cash control contains the total value of the items entered in the Petty Cash list. This amount will change automatically as you alter items in the Petty Cash list. The Petty Cash amount is displayed only if every item in the Petty Cash list is represented by the currency of the country that is currently selected. If at least one item in the Petty Cash list doesn't satisfy this condition, the Petty Cash amount is displayed as a red dash, indicating a conflict. It will be displayed in red if your cash till count plus the Petty Cash amount is "under", or less than the Cash Drawer Amount. And it will be displayed in green (in a negative currency format for the selected country) if your cash till count plus the Petty Cash amount is "over", or greater than the Cash Drawer Amount. In case the cash till is balanced, the Difference field is displayed in default (black) color. The Counted By list entries may be also used when adding items into the Petty Cash list. The Counted By list is initially empty, so the first time you do cash count you will need to enter a person's name who counted the till in the text box field. (There's no restrictions on which characters you can enter, except that the person's name has to be less than 256 characters long.) After you enter the name you can either hit Done, or click the Plus sign button on the right to make the Cash Counter memorize this name. You can specify in the Preferences whether it's necessary for everyone to enter their name in the Counted By control before finalizing the cash count by pressing Done button. In case your name isn't in the list, you can simply type it in the text box field. The Cash Counter will remember it after you finalize the cash count by clicking Done. Click the "+" button on the right to add a new name to the Counted By list. Note that the name to add to the list must be typed in the text box field. In case such name already exists in the list, or if the text box field is empty the Cash Counter does nothing. Click the "-" button on the right to remove a name currently selected in the text box field from the Counted By list. In case such name does not exist in the list, or if the text box field is empty the Cash Counter does nothing. In case the name being removed is also used in one or more items in the Petty Cash list, you will see a warning, in which case the Cash Counter will need your confirmation to remove this name from the Counted By list. While deleting names from the Counted By list, the Cash Counter treats them in a case-insensitive way. This means that names such as "John Doe" and "john doe" will be treated as the same name. The Petty Cash list can be expanded to stretch all the way to the top of the Cash Counter window. Item column - contains descriptive name of a petty cash item. Try to use short names that best describe your petty cash items. Date column - contains short version of a date when a petty cash item was entered. The date is presented in the format of the currently selected country. Amt column - contains the amount of a petty cash item. Each amount is presented in the currency of the country selected at the time when each petty cash item was entered. Although it is possible to enter several petty cash items using currencies of two or more different countries, doing so is not recommended because it will prevent the Cash Counter from calculating the total for the Petty Cash amount. User column - (originally removed) contains the name of a person who entered a petty cash item. Entering names into this column, as well as using it, is optional. To resize columns hover the mouse cursor over the column header separator, and drag it either to the left or to the right. 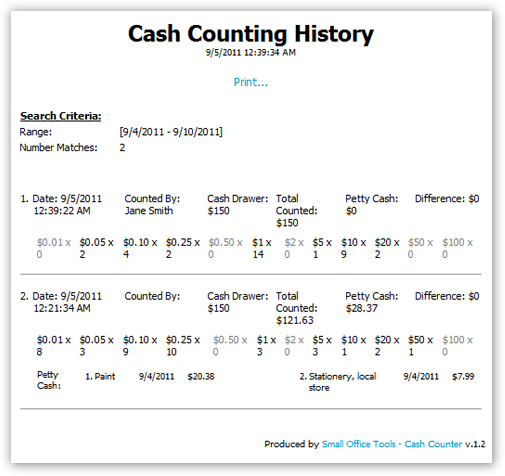 The Cash Counter will memorize the Petty Cash list column layout the next time you run it. To move columns drag a column header label either to the left or to the right. This will let you reposition the Petty Cash list columns. The Cash Counter will memorize the Petty Cash list column layout the next time you run it. To add or remove a certain column, either right-click on the column header and select Edit Columns, or go to Preferences and switch to the Petty Cash tab. Use this page for further instructions. To reset columns to their default look, right-click on the column header and select Reset to Defaults. Note that the date and the amount will be filled out automatically for you. The date is represented by today's date in a short format for the selected country, and the amount will be set to zero. At this point you can begin entering your new petty cash item. In case you don't enter a petty cash item's descriptive name, nor enter the name of a person in the User column, and keep its amount at 0, this item will be automatically removed the next time you run the Cash Counter. Note that the column currently being edited is displayed with a yellow background (for our selected Windows theme). You can edit out or adjust the currently editable column by using the keyboard. Note that the Date and the Amount columns expect you to enter their values in a certain format, that is specific for the currently selected country. Click away somewhere on another control to accept the edit. Press Tab key on the keyboard to accept the edit and switch to the next editable column in the Petty Cash list. Press Esc key on the keyboard to cancel the edit and return the petty cash item to its original value. To remove one or more entries from the Petty Cash list first select them with the mouse. To select a group of items, click on the first of them, then press and hold down the Shift key and click on the last item in the group. This should select all items in between them. You can also press and hold down the Ctrl key while clicking on the items in the Petty Cash list to toggle their selection. When one or more Petty Cash list items are selected, either click the "-" button above it, or go to Edit -> Remove Selected Petty Cash Item(s) in the main menu, or right-click on the selection and click Remove. Before removing selected petty cash items the Cash Counter will show a confirmation prompt. WARNING: Removing Petty Cash list items cannot be undone or reverted! You can also finalize the cash count by going to File -> Done in the main menu, or by pressing Ctrl+Enter on the keyboard. In case all of the cash count fields are empty, clicking the Done button will make the Cash Counter simply close without doing the finalization. If you set up the Preferences to require users to fill out the Counted By control and it is left blank when the Done button was clicked, the Cash Counter may flash the Counted By control with red. Depending on the Preferences setting the Cash Counter may also prevent you from finalizing the cash count without the Counted By field being filled out. When you're done filling out the cash count fields you will need to finalize it by clicking the Done button. This will enter your cash (till) count into the Cash Counter's database, and, if configured in Preferences, will display a printout of the Cash Counting Report, that you may use in your financial accountability paperwork. In case you want to print out the Cash Counting Report for the current cash count fields without finalizing it, either go to Reports -> Cash Counting Report in the main menu, or press Ctrl+P on the keyboard. The Cashing Counting Report is laid out in the form best suitable for printing. You may set up in Preferences whether the Cash Counter needs to automatically open up the Print dialog when this report is displayed. Clear Cash Count (Ctrl+Backspace) - clears all of the cash count fields. This command is also available from a keyboard shortcut of Ctrl+Backspace. The Cash Counter will issue a confirmation warning if you incur this command from the main menu and at least one of the cash count fields isn't empty. Note that the warning isn't issued if you use the keyboard shortcut. Restore Last Cash Count (Ctrl+R) - restores the values of the cash count fields to the last finalized cash count, if one is available for the currently selected country. This command is also available from a keyboard shortcut of Ctrl+R. Import Database - opens a new window that allows to import (or open) a previously exported database, or reset the database to its original state. Import a blank database - this option will reset the current database to its blank (or empty) state, the way it was when you first installed the Cash Counter. To ensure that the database is not reset by accident, to proceed with this option you will need to type in a confirmation phrase (which is "Import Blank" in the English version) in the "confirmation" field. WARNING: After the database is reset there will be no way to revert or restore it! Make sure to make a backup of your existing data first by exporting the database! The data affected by this action includes the following: all previous cash counts, all Petty Cash list items, all user accounts, all currency and denomination adjustments, most preferences. 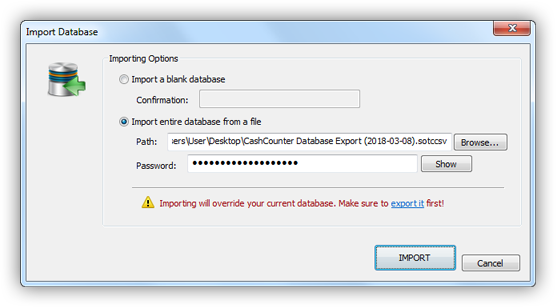 Import entire database from a file - this option will import (or load) the entire Cash Counter database from a previously exported file. You can use this option to move your Cash Counter data from one location to another, or to make a backup. WARNING: After the database is imported there will be no way to revert or restore the previous database! Make sure to make a backup of your existing data first by exporting the database! The data affected by this action includes the following: all cash counts, all Petty Cash list items, all user accounts, all currency and denomination adjustments, most preferences. Path - specifies file path to the previously exported database to import. Browse button displays a user dialog that helps you locate the database file to import. Password - use this field to specify a password that was used to encrypt exported database, or leave it blank if there's no password. IMPORTANT: For security reasons, forgotten or lost passwords cannot be restored neither by the Cash Counter software, nor by our support team! Make sure to memorize the password that was used to export the database. Show/Hide button displays (or later hides) the password field characters. Import button begins the process of importing the database. The process of importing the database may take some time, depending on the size of the database and the strength of encryption that was used when the database was exported. 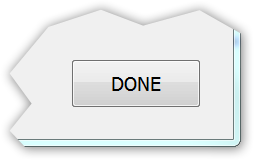 Cancel button closes this window without importing the database. 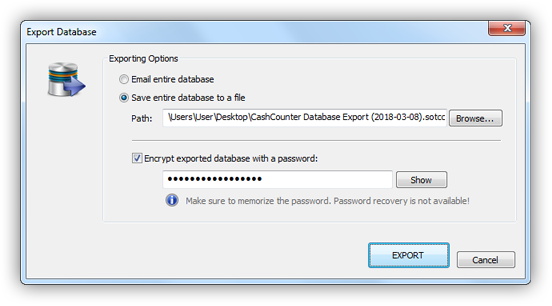 Export Database - opens a new window that allows to export (or save) the database into a file, thus making a backup copy of the data currently stored in the Cash Counter. The data included in the export is the following: all cash counts, all Petty Cash list items, all user accounts, all currency and denomination adjustments, most preferences. Email entire database - exports the Cash Counter database into a file (and optionally encrypts it if the password is specified in the field below) and generates an email with the exported file attached to it, using your default email client. Security Warning: Make sure to provide a strong password to enable encryption of the exported database when using this option! Emailing unencrypted database is not safe! This option only generates an open email but does not send it. When the blank email with the exported database file attached to it is displayed in a new window, a user will need to provide the recepients' email address to send such email. A default email client capable of sending email attachments is required for this option to work. Example of such email client is Microsoft Outlook. Save entire database to a file - exports the Cash Counter database into a file, and optionally encrypts it if the password is specified in the field below. Path - specifies file path to place the resulting exported database to. By default the Cash Counter will make up a file path on your Windows user desktop with the file name of the current date. You can modify this name right in this field, or by using the Browse button. Browse button displays a user dialog that helps you make up a file path to export the database into. 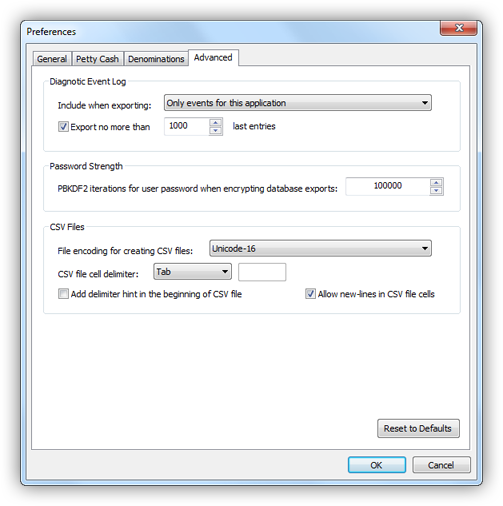 You can customize the strength of encryption used for exporting database in the preferences window. The strength setting only applies when the password is provided below. Password field lets you type the password that will be used for encryption of the exported database. This password will be required to import the database. There is no restrictions on the length of the password, for as long as you type at least one character. Keep in mind that passwords are case-sensitive, meaning that small and capital letters are treated differently. Although not enforced, it is recommended that you provide at least an 8 to 10 character password. For a stronger password use a password manager to generate it. IMPORTANT: For security reasons, forgotten or lost passwords cannot be restored neither by the Cash Counter software, nor by our support team! Make sure to memorize the password. Export button begins the process of exporting the database. The process of exporting the database may take some time, depending on the size of the database and the strength of encryption. Cancel button closes this window without exporting the database. 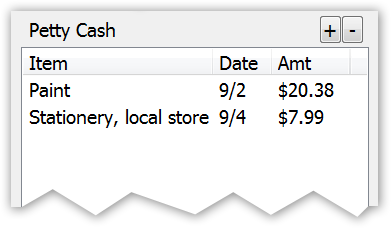 Done (Ctrl+Enter) - finalizes the cash count, if one is available, and closes the Cash Counter. This command is also available from a keyboard shortcut of Ctrl+Enter. Exit - closes the Cash Counter without finalizing the cash count. If set up in Preferences, the Cash Counter will memorize the values of the cash count fields and will restore them the next time you run it. Add Petty Cash Item (Ctrl+N) - allows to add a new item to the bottom of the Petty Cash list. This command is also available from a keyboard shortcut of Ctrl+N. Remove Selected Petty Cash Item - allows to remove selected items from the Petty Cash list. 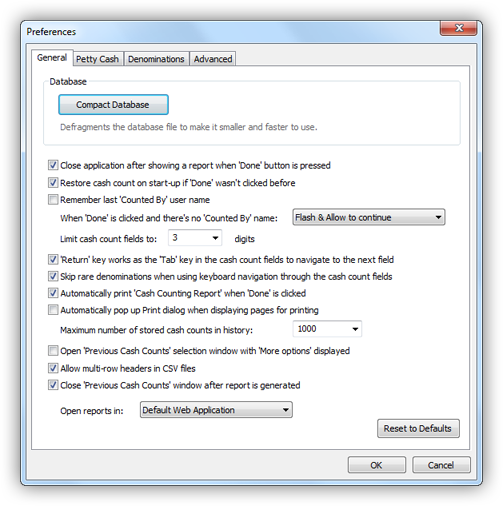 Edit Currency Format - opens the Preferences page that allows to customize selected currency layout of the cash count fields in the main window of the Cash Counter. Use this page if default layout of the currency for your country is incorrect or needs some adjustments. 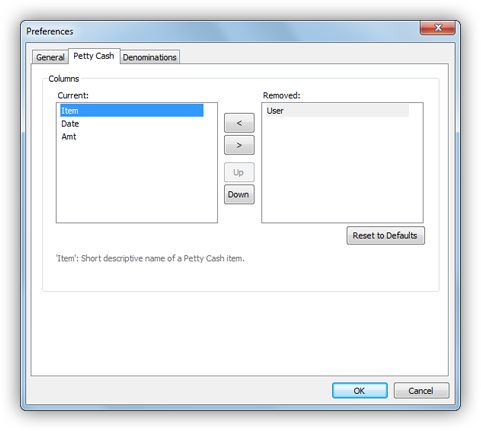 Preferences (Ctrl+K) - displays Preferences window that allows to configure settings for the Cash Counter. This command is also available from a keyboard shortcut of Ctrl+K. <List of countries> - provides the list of the alphabetized country names currently supported by the Cash Counter. Picking one will change the layout of the cash count fields in the main window, as well as the numbers, currency and date formats to the ones specific for a selected country. The list of available countries is dependent on the subset of languages installed in your Operating System. You may have to scroll the list of countries vertically, if it doesn't fit on the screen. Request To Add Country - opens a web page that will allow you to send us your request to add a specific country. In that case please make sure to provide some details about your specific currency and its format. Hide Rare Denominations - is a toggle switch that is either checked or unchecked. To toggle its state click this item. When rare denominations are hidden they will not be included in the cash count fields layout, as well as in the Cash Counting Report. Rare denominations are specific for each country's currency and can be set up in Preferences. Expand Petty Cash List - is a toggle switch that is either checked or unchecked. To toggle its state click this item. When Petty Cash list is expanded it will be stretched to the top of the Cash Counter window, covering the graphic that is displayed above it. Cash Counting Report (Ctrl+P) - allows to print out the Cash Counting Report for the current cash count fields without finalizing it. This command is also available from a keyboard shortcut of Ctrl+P. Previous Cash Counts (Ctrl+Shift+P) - allows to view, export or print a report of previous cash counts. This command is also available from a keyboard shortcut of Ctrl+Shift+P. The Cash Counter stores up to 1,000 latest Cash Counting Reports by default. This value can be changed in Preferences. Range control - provides a preset of the following ranges to use for the search of the previous cash counts: Last 5 counts, Last 10 counts, Last 25 counts, Last 50 counts, Last 100 counts, Today, Yesterday, This week, Last week, This month, Last month, All counts and Custom date range. From / To controls - in case Custom Date Range is selected in the Range control, let you specify a custom date range to view the cash counts for. Both dates in the range must be provided inclusively, meaning that the From and To dates will include cash counts during those dates. Printable form - will open generated report that will allow viewing and printing. You can specify which application to open such report with in Preferences. Open as CSV file (MS Excel) - will open generated report as a file saved as Comma-Separated Values (or CSV.) This format is often used by data processing applications, such as Microsoft Excel. If Microsoft Excel is installed in the system, it will be used to open generated CSV files. You can specify additional options for generating CSV files in Preferences. Save as CSV file - will export generated report as a file with Comma-Separated Values (or CSV.) This format is often used by data processing applications, such as Microsoft Excel. Open file for viewing - used only if Present As control is selected to "Save as CSV file". If checked, will open generated CSV file in the default application that is setup in the Windows settings to open CSV files. If Microsoft Excel is installed in the system, it may be used to open generated CSV files. Present counts from the latest to the oldest - if checked will present all found cash counts with the latest counts on top of the report, otherwise the latest counts will be at the bottom. OK button - generates the report with requested cash counts. The report selection window will be closed automatically after you click OK. You can change that in the Preferences. Cancel button - closes this window without producing a report. Counted By control - allows you to limit the search for the cash counts done by a specific person. The name provided in this field is treated as case-insensitive, meaning that names such as "John Doe" and "john doe" will be treated as equal. Cash drawer amount controls - allow you to limit the search for the cash counts with a specific Cash Drawer Amount. To use this option fill out the text box on the right with the Cash Drawer amount and provide one of the following equation criteria in the drop-down box: Equal to, Not equal to, Less than, Less than or equal to, Greater than, Greater than or equal to. To understand how these controls are used in the search, picture that we want to limit our search to the cash counts with the Cash Drawer Amount less than or equal to $200. In this case we would select Less than or equal to in the drop-down control and type in 200 in the text box. Note that typing the currency symbol (or dollar sign in our case) is not necessary. In case you leave the text box control on the right empty, this search criterion will not be used for the search. Note that setting it to a 0 will have a different effect - 0 will be interpreted as a 0 amount. Total counted controls - allow you to limit the search for the cash counts with a specific Total Counted amount. To use this option fill out the text box on the right with the Total Counted amount and provide one of the following equation criteria in the drop-down box: Equal to, Not equal to, Less than, Less than or equal to, Greater than, Greater than or equal to. To understand how these controls are used in the search, picture that we want to limit our search to the cash counts with the Total Counted amount less than or equal to $200. In this case we would select Less than or equal to in the drop-down control and type in 200 in the text box. Note that typing the currency symbol (or dollar sign in our case) is not necessary. Petty cash controls - allow you to limit the search for the cash counts with a specific Petty Cash amount. To use this option fill out the text box on the right with the Petty Cash amount and provide one of the following equation criteria in the drop-down box: Equal to, Not equal to, Less than, Less than or equal to, Greater than, Greater than or equal to. To understand how these controls are used in the search, picture that we want to limit our search to the cash counts with the Petty Cash amount less than or equal to $200. In this case we would select Less than or equal to in the drop-down control and type in 200 in the text box. Note that typing the currency symbol (or dollar sign in our case) is not necessary. Difference controls - allow you to limit the search for the cash counts with a specific Difference amount. To use this option fill out the text box on the right with the Difference amount and provide one of the following equation criteria in the drop-down box: Equal to, Not equal to, Less than, Less than or equal to, Greater than, Greater than or equal to. To understand how these controls are used in the search, picture that we want to limit our search to the cash counts with the Difference amount less than or equal to $200. In this case we would select Less than or equal to in the drop-down control and type in 200 in the text box. Note that typing the currency symbol (or dollar sign in our case) is not necessary. Total count amounts only - will include only total amounts of the cash count. It will also include the date & time of the count, who the count was done by, and the differences between the cash count, amount in the cash drawer and the total Petty Cash amount for the day. Petty Cash items only - will include the break-down of the Petty Cash items only. It will also include the date & time of the count, who the count was done by, and the differences between the cash count, amount in the cash drawer and the total Petty Cash amount for the day. Full cash counts & Petty Cash items - will include total amounts of the cash count, the break-down of denominations for each count, and the break-down of the Petty Cash items for the day. It will also include the date & time of the count, who the count was done by, and the differences between the cash count, amount in the cash drawer and the total Petty Cash amount for the day. Display currency symbols - if checked, will display currency amounts using their corresponding symbols in the report. (Example: $1 for one US Dollar.) If unchecked, will display amounts as plain numbers. Microsoft Excel must be installed in the system to be used to open generated reports. Online Manual (F1) - opens the online version of this manual. This command is also available from a keyboard shortcut of F1. Note that the Internet connection is required for this option to work. Video Tutorial (Alt+F1) - opens the web site with our video tutorial, or screencasts on how to use the Cash Counter. This command is also available from a keyboard shortcut of Alt+F1. Check For Updates - opens the web site that allows to check if there's an update available for your version of the Cash Counter. This command is not available in the Windows Store version of the app. In case you would like to receive a notification of an update when it is released, follow us on our Twitter feed. Buy Your Copy - (displayed in a trial copy only) allows you to connect to our website to purchase the license for this software. If you're using the desktop version of the Cash Counter app your payment will be processed via a secure connection through PayPal. In case of a Windows Store version of the Cash Counter app, Windows 10 will process your payment via its popup window. Note that your payment & personal information will not be shared with us. This ensures a secure transaction for our customers. For additional details please check this FAQ. Authorize Your Copy - (displayed in a desktop trial copy only) opens up a window that allows you to authorize (or register) your copy of the Cash Counter software. To do so you will need your individual registration name and code, which will be emailed to your PayPal address after you make a one-time purchase of the Cash Counter license. Registration name and code are issued per Windows user account and cannot be shared. Re-using the registration name and code on the number of Windows user accounts that exceed the license term may invalidate your license! When moving the Cash Counter software to a new location, please make sure to de-authorize it. If you did not receive the registration email please make sure to check your Spam, Junk or Other folders. Many email providers place registration emails in those locations. In case you still can't find the registration email, read FAQ 22 that will explain how you can contact us. This option is not available if you downloaded the Cash Counter app from the Windows 10 Store. De-authorize - (displayed in an authorized desktop copy only) opens a popup window with a confirmation before performing the de-authorization (or removal) of the license for that specific copy of the Cash Counter software. Use this option when re-installing or moving the software to a new computer, or Windows user account. Frequently Asked Questions - opens the web site with answers to the most often asked questions. Please check this page if you have a question about the Cash Counter before submitting that question to our support team. Report a Bug - opens the web page that allows you to submit a bug report about the Cash Counter software. Please make sure to provide as many technical details as possible. Open Event Log - opens Windows Event Log viewer that can display diagnostic information about the software running on your system. Export Event Log - opens a window that allows you to pick the location to export (or save) a copy of the Windows Event Log. Use this option if you encounter a bug (or a glitch) in the Cash Counter software to diagnose its cause. The technical information displayed in the event log is mostly intended for the developers of the software and is not documented. By default Cash Counter will export only last 1000 of its own diagnostic events that were logged on that computer. You can customize this in the Preferences window. In the default configuration, the Cash Counter software was coded to avoid logging of any of your sensitive information into the event log. In despite of that, to avoid potential misunderstanding, make sure to review the exported copy of the event log before sending it out. User Feedback - allows you to connect to our website to leave your comment about this program. Request Accessibility Improvement - we designed the Cash Counter app with accessibility features in mind to facilitate its use for everyone. But in case you find something that makes it difficult for you to use this program, click this option to open the page that will allow you to inform us about it. We will try to do our best to correct the issue. Also note that this feature is for reporting accessibility issues only and should not be used for general feedback. Suggest An Improvement - opens the web site that allows you to submit your suggestion on how we can improve the Cash Counter software. We appreciate your honest feedback! Version displays the current version of your copy of the program. Additionally this line will denote your copy of the program as being a Desktop or a Windows Store version of the app. Such destinction stems from where you downloaded the app from. Buy Copy button (in case of a trial copy) displays information to let you purchase a license for your copy of the Cash Counter app. System Information provides technical information about the computer the program runs on. Copy button lets you copy the system technical information to the Windows Clipboard. Registration For This Copy (in case of a purchased copy) provides information about the registration license for your copy of the program. De-authorize button (in case of a purchased desktop version of the Cash Counter app) lets you de-authorize that copy of the Cash Counter app. This is required in case you decide to move your copy of the desktop version of the Cash Counter app to another computer. In this case you are required to de-authorize, or remove the registration license from the old computer. For more details check this FAQ. De-authorizing your copy of the Cash Counter will remove the registration license and then close the program. Restarting the Cash Counter from the same Windows user account will most certainly display a message that your copy has expired. In case you decide to reinstall your desktop copy of the Cash Counter on the same computer you are allowed to re-use the same registration license, provided that you de-authorized all other copies of the program to fit within your license requirements. De-authorizing is not available for Windows Store versions of the Cash Counter app. 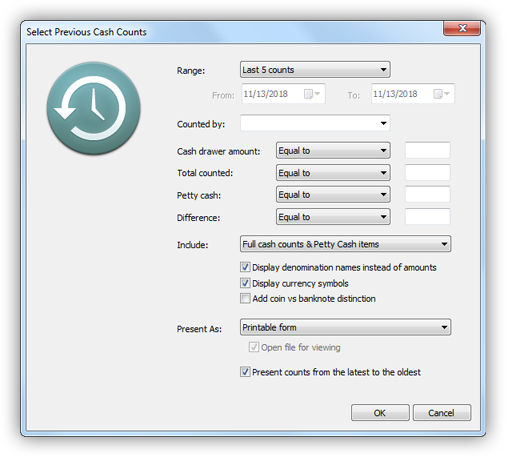 The Preferences window allows you to customize the Cash Counter's settings. It can be accessed by going to Edit -> Preferences in the main menu, or by pressing the Ctrl+K keyboard shortcut. Compact Database - as the message below it suggests, clicking this button will defragment the database file that in turn will make it smaller in size as well as faster to run. In despite of the benefits of defragmentation, you do not need to worry much about using this option on a regular basis. We designed the Cash Counter to be both fast and compact and take care internally of its own database integrity. This option is provided here for those who want to incur the function of defragmentation manually. Restore cash count on start-up if 'Done' wasn't clicked before - in normal circumstances you would finalize each cash count, by clicking the Done button. But in case you close the Cash Counter program before you finalized it, your cash count may be lost. When this option is checked it will make the Cash Counter preserve the cash count fields in case you close the program before finalizing it. If you uncheck this option, an un-finalized cash count will be lost in case you close the Cash Counter. Remember last 'Counted By' user name - if checked will make the Cash Counter memorize a person's name who did the last cash count, so that when you run the program again the Counted By control will be filled out with their name. Uncheck this option to make Counted By control to be empty by default when the program starts. No special action - will make the Cash Counter simply ignore this situation. Flash & Allow to continue - will make the Cash Counter flash the Counted By control with red, and allow to finalize the cash count after that. Flash & Do not allow to continue - will make the Cash Counter flash the Counted By control with red, and prevent the cash count from being finalized until a user fills out the Counted By control. The minimum allowed value of digits is 1. The maximum one is 9. 'Return' key works as the 'Tab' key in the cash count fields to navigate to the next field - controls the way user can navigate through the cash count fields using the Enter (or Return) key on the keyboard. When checked will make the Enter key switch to the next control in the cash count fields. If you uncheck this option, pressing the Enter key will revert to a default action in Windows, i.e. it will be analogous to clicking the Done button. Skip rare denominations when using keyboard navigation through the cash count fields - when checked will make the Cash Counter skip all rare denominations when user navigates through the cash count fields using the keyboard (i.e. Tab, Enter, Up and Down Arrow keys). Automatically print 'Cash Counting Report' when 'Done' is clicked - when checked will make the Cash Counter produce the Cash Counting Report when user clicks the Done button and finalizes the cash count. Note that if you uncheck this option the Cash Counter will still finalize each count, but without producing the Cash Counting Report. 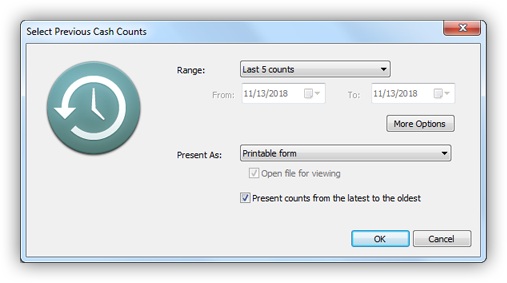 Automatically pop up Print dialog when displaying pages for printing - in case you prefer to print out the Cash Counting Report and the Cash Counting History Report produced by the Cash Counter, this option can save you time by automatically popping up the Print dialog window, that lets you select a printer, when those reports are generated. For that, check this option. Maximum number of stored cash counts in history - every time you finalize your cash count (by clicking the Done button) the Cash Counter remembers it in its database for a possible later retrieval through the Previous Cash Counts option. This setting controls how many cash count reports the Cash Counter is allowed to store in its history. (By default it stores 1,000 reports.) To change this value, either select it from the drop-down list of predefined values, or simply type in your number in the text box. The minimum allowed value of stored cash counts is 1. The maximum one is 999,999. Note that the Cash Counter uses a very compact form of storing all your previous cash counts, so setting this value high will not jeopardize the free space available on your hard drive. The Cash Counter recycles older cash counts in case it reaches the limit of entries set up by this option. Once recycled the cash counts cannot be restored! WARNING: Reducing the number of stored cash counts may irreversibly remove older cash counts. If this happens you will not be able to recover those cash counts! Open 'Previous Cash Counts' selection window with 'More options' displayed - when checked will make the Cash Counter open the Previous Cash Counts window with the More options enabled. Uncheck this option to display the Previous Cash Counts window in its compact form. Allow multi-row headers in CSV files - when generating files with Comma-Separated Values (CSV), if enabled, this option will allow the use of the first row in such CSV files to contain headers formatted in multiple rows. If unchecked, the first header row in the generated CSV file will be always formatted as a single row. Close 'Previous Cash Counts' window after report is generated - if checked, will close the Previous Cash Counts window after report of previous cash counts is generated. If unchecked, the Previous Cash Counts window will be kept on the screen after generation of a report. Internet Explorer - will instruct Cash Counter app to use Internet Explorer to display reports. Default Web Application - will instruct Cash Counter app to use a default web application that is currently defined by the Operating System to display reports. Cash Counter formats its reports as files with .htm extension. Built-in Viewer - will open reports in Cash Counter's own viewer to ensure compatibility between different operating systems and user settings. This option is used by default. OK button saves changes in all tabs of the Preferences window and applies them to the Cash Counter program. Note that the changes are applied only when you OK the Preferences window. Cancel button discards all changes done to the settings in the Preferences window since it was opened. You can also cancel all changes by simply closing the Preferences window with the X button at the top right corner of its window. Current list contains column names that are currently visible in the Petty Cash list. The order, from top to bottom, in which they are presented in this list, denotes the order, from left to right, that these columns will appear in the Petty Cash list. Removed list contains column names of the Petty Cash list that are currently hidden. Note that hidden columns still retain their data. "<" button allows to move a selected column from the Removed to the bottom of the Current list. ">" button allows to move a selected column from the Current to the Removed list, effectively hiding the column. Reset to Defaults button allows to reset all columns to their predefined defaults. Rearranging the Petty Cash list columns also resizes its header columns to their default widths. Please consider using this window to correct any mistakes that you find in the currency format for your specific country, and then use the link at the bottom of that window to submit your corrections for our developers. It is a very streamlined process that will greatly help us to improve future versions of the Cash Counter software. Thank you! Country selector provides a drop-down list of countries currently available for the Cash Counter. The currency denominations displayed below are specific for the country selected in this control. Left Column list contains currency denominations that will be displayed in the left column of the cash count fields in the main window of the Cash Counter for the country selected in the Country control above. The order at which denominations appear in this list is determined automatically by the amount of each denomination, and will be applied to the order of these denominations in the cash count fields as well. Although not rigidly enforced, we intended the denominations in the left column to represent coins, and denominations in the right column to represent bank notes. The left column list can be set empty. The only stipulation that the Cash Counter imposes is that you specify at least one non-rare denomination in either left or right column list. You can right-click inside the left column list to get a pop-up menu with similar commands that are available in this window. Right Column list contains currency denominations that will be displayed in the right column of the cash count fields in the main window of the Cash Counter for the country selected in the Country control above. The order at which denominations appear in this list is determined automatically by the amount of each denomination, and will be applied to the order of these denominations in the cash count fields as well. The right column list can be set empty. The only stipulation that the Cash Counter imposes is that you specify at least one non-rare denomination in either left or right column list. You can right-click inside the right column list to get a pop-up menu with similar commands that are available in this window. "<" button moves a selected denomination from the right column list to the left column list. The order at which denominations appear in the left column list is determined automatically by the amount of the denomination. Coins are also grouped together and appear above the bank notes. Although not rigidly enforced, we intended the denominations in the left column to represent coins. ">" button moves a selected denomination from the left column list to the right column list. The order at which denominations appear in the right column list is determined automatically by the amount of the denomination. Bank notes are also grouped together and appear below the coins. Although not rigidly enforced, we intended the denominations in the right column to represent bank notes. Selected Denomination section provides controls to edit a denomination currently selected in either left or right column list. Note that these controls are disabled if no denomination is selected in either of the lists. Name text box allows you to edit the name of the currently selected denomination. There's no restriction on which characters you can use for the name of denomination, although the length of this name cannot exceed 48 characters. Our suggestion is for you to try to keep the name of each denomination as short as possible to preserve the visual layout of the cash count fields in the main window of the Cash Counter. If you wish to, the name of a denomination can be left empty. You can also make two or more denominations have identical names. Type control allows to make the currently selected denomination as either a coin or a bank note. The Cash Counter doesn't make any distinction between coins and bank notes during cash counting. This distinction was introduced only for a user convenience. It also allows to specify two denominations with an identical value (by making one a coin and another one a bank note). Rare amount checkbox allows to specify if the currently selected denomination is a rare one. If checked, the denomination will be considered as rare. Rare denominations can be treated differently when a user navigates through the cash count fields using the keyboard. They are also displayed with a grayed out font and a slight spacer around them in the main window of the Cash Counter. A user can also specify to hide rare denominations from reports and from the main window of the Cash Counter. Rare denominations are specific for the currency of each country. Value text box allows to specify the monetary value of the currently selected denomination. The number format with which you can specify the currency value is defined by the country currently selected in the Country control. For instance, to specify a 5-cent piece for the U.S. currency, you would type 0.05, but to specify a 5-cent piece for the French currency, you would type 0,05. You must provide currency values for each denomination. These values must be represented by positive numbers and cannot be set to zero. Two or more denominations of the same type (coin or bank note) cannot have identical currency values. While specifying the currency values for denominations be aware of the rounding that the Cash Counter performs for denominations of each country. For instance, by default the U.S. currency value cannot be set to less than 0.01. An attempt to set it to, say, 0.005 will round it up to 0.01that will make this denomination to have the same value as U.S. Pennies. 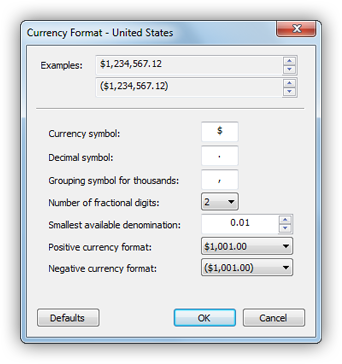 To adjust this rounding behavior, check the Smallest available denomination and the Number of fractional digits settings in the Currency format window. 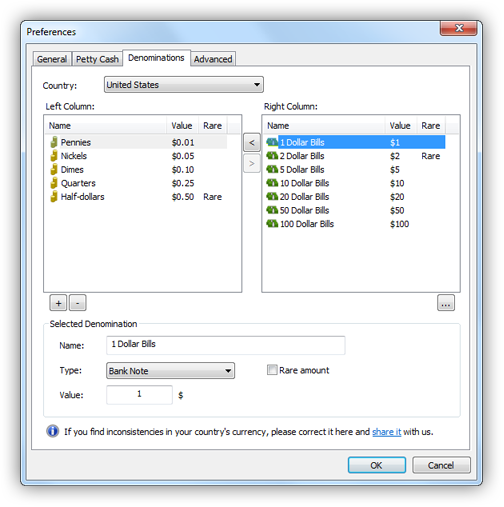 The country displayed in the title of the Add Denomination window will be used for the currency and number formatting in this window. The controls in this window are similar to the controls explained above for editing a selected denomination. ADD button will add a new denomination to either left or right column list. Which list depends on how you get to open the Add Denomination window. If you used the "+" button, the Cash Counter picks the list using the type of a new denomination - coins are added to the left column list and bank notes to the right column list. You can avoid this ambiguity if you invoke the Add Denomination command from a pop-up menu after a right-click on either left or right column list. The Cash Counter does not perform exhaustive correctness checks while adding new denominations at this stage. Cancel button closes the Add Denomination window without adding a new denomination. The same effect can be achieved by closing this window with the X button in its top right corner. "-" button (or Remove Denomination command) removes a selected denomination from the list. Reset All Denominations - resets all denominations and currency format to their defaults for the country selected in the Country control above. Note that resetting denominations and currency format for the currently selected country has no effect on denominations and currency formats of other countries. The country displayed in the title of the Currency Format window will be used for the currency and number formatting in this window. Examples fields show the example of a positive currency value (on top), and of a negative currency value (below) as they would look with the settings in controls below. These fields are updated dynamically as you change controls in this window. You can use the Up and Down arrows on the right off of these controls to increase or decrease their values, respectively. Currency symbol - allows to specify the currency symbol for a selected country, such as the $ sign for U.S. dollar. Although it is possible to set the currency symbol empty, doing so is not recommended! Be aware that adding wrong characters, such as numbers, signs or even some letters, to the currency symbol can confuse users as well as lead to unpredictable results during calculations! Setting the currency symbol to the same symbol(s) as the decimal symbol or the grouping symbol for thousands is not allowed. Decimal symbol - allows to specify the decimal symbol for a selected country, such as the . (period) in 1.25 for U.S. The decimal symbol is required and cannot be set empty. Be aware that adding wrong characters, such as numbers, signs or letters, to the decimal symbol can confuse users as well as lead to unpredictable results during calculations! Setting the decimal symbol to the same symbol(s) as the currency symbol or the grouping symbol for thousands is not allowed. Grouping symbol for thousands - allows to specify the grouping symbol for thousands for a selected country, such as the , (comma) in 1,000 for U.S. The grouping symbol for thousands can be set empty. Be aware that adding wrong characters, such as numbers, signs or letters, to the grouping symbol for thousands can confuse users as well as lead to unpredictable results during calculations! Setting the grouping symbol for thousands to the same symbol(s) as the currency symbol or the decimal symbol is not allowed. This setting is used by the Cash Counter to display currency amounts that it works with. For instance, if for U.S. currency this value is set up as 2 digits, an internal amount of 1.234 will be rounded up to 1.23 due to the fact that only 2 fractional digits were required. Note that such rounding is done with the Smallest available denomination setting in mind. This setting goes in tandem with the Smallest available denomination and must be configured appropriately. We had to separate these two settings due to the fact that currencies of some countries required such adjusted precision. You can use the Up and Down arrows on the right off of this control to increase or decrease its value by the factor of 10, respectively. The number format with which you can specify this value is defined by a selected country. For instance, to specify 0.01 for the U.S. currency, you would type 0.01, but to specify the same for the French currency, you would type 0,01. This setting is used by the Cash Counter to round up currency amounts that it works with. For instance, if for U.S. currency this value is set up as 0.01, an internal amount of 0.003 will be rounded up to 0.01 due to the fact that the smallest allowed value is 0.01. Note that such rounding is done with the Number of fractional digits setting in mind. This setting goes in tandem with the Number of fractional digits and must be configured appropriately. We had to separate these two settings due to the fact that currencies of some countries required such adjusted precision. Positive currency format - allows to specify the format for the positive currency for a selected country. Negative currency format - allows to specify the format for the negative currency for a selected country. Defaults button lets you reset controls in this window to their defaults (effectively resetting the currency format for a selected country). This command does not change the currency denominations themselves. OK button saves changes done to controls in this window and closes it. Note that OK'ing this window saves all changes in a temporary place in the Denominations window of the Preferences. These changes can still be discarded if the Preferences window is canceled. Cancel discards any changes done to controls in this window and closes it. Copy Currency Format - copies the selected currency format along with its technical information onto the Windows Clipboard as text. Use this option to collect your currency format information for developers of the program. Send Currency Format To Developers - connects to our web site and fills out the online form with the selected currency format along with its technical information. Use this method to submit your currency correction to developers of the program. Only events for this application - when selected will export only events pertaining to the operation of the Cash Counter software. All events logged in Windows (along with this application) - when selected will include all events that were logged by all software running in the operating system. This may be helpful to diagnose issues relevant to operation of the Cash Counter that were not directly caused by it. Note that the size of the exported event log file will greatly increase if this feature is enabled. Security Warning: If this feature is enabled, the exported event log file will contain diagnotic data from other applications running on your system, that may or may not contain your personal or senstive information. In this case the Cash Counter will have no means to differentiate between the types of data that was logged into Windows Event Log by other applications. To avoid potential misunderstanding, make sure to review the exported copy of the event log before sending it out. Export no more than - when checked will limit the number of exported event log entries to the last N, which value is specified in the control on the right. If unchecked, all available event log entries will be exported. You're allowed to specify this cutoff number from 100 and up. Note that the size of the exported event log file may greatly increase if this checkbox is unchecked, or if the cutoff number is set too high. PBKDF2 iterations for user password when encrypting database exports - when a user specifies a password to encrypt exported database, the key for such encryption will be generated from provided user password using the PBKDF2 cryptographic function. This value controls the number of its iterations, or the strength of generated encryption key. The higher the number, the stronger the encryption. You're allowed to specify the number of iterations from 10000 and up. The default value is 100000 iterations. The general rule of thumb is that the larger the number of iterations, the stronger the encryption of the exported database. Note though, that a very large number of iterations will also make exporting and importing significantly slower, and is entirely dependent on the hardware of the target computer. Technical: For encryption of its exported databases the Cash Counter software uses AES-256 encryption with the GCM authentication method. The encryption code is implemented using Crypto++ library. IMPORTANT: Although exported database can be encrypted and is safe for emailing or other transmission via a public channel, the database is only lightly scrambled when stored on the local computer and is used by the Cash Counter software. ANSI - This encoding uses a single byte to encode each text character in the CSV file. And although it is widely accepted, this encoding may lead to the loss of data exported in the CSV file if such data contains characters other than ASCII. UTF-8 - This encoding uses variable length characters to encode text in the CSV file. Unicode-16 - This encoding uses two bytes (or 16 bits) to encode each text character in the CSV file, and is supported by Microsoft Excel. User-default - when selected, the Cash Counter program will use text delimiter(s) from the account settings for the current Windows user. Comma (,) - will use comma as a cell separator. Semicolon (;) - will use semicolon as a cell separator. Custom - will allow you to specify up to 3 characters to be used as cell separator(s). Note that not all characters may be used for this option. If this option is selected, provide custom cell separator character(s) in the field to the right. Allow new-lines in CSV file cells - if checked, will allow special new-lines in the cells of generated CSV files. If unchecked, all cells in CSV file will be formatted as a single line of text. Reset to Defaults button allows to reset all fields in this tab to their predefined defaults. Thank you for using the Cash Counter! We're actively working on improving the Cash Counter software and welcome any feedback from its users.